Hello Wednesday and hello Chicago winter. I mean, I couldn’t be more over this weather and ready for a change of pace! Next week I’m headed to warmer weather and I’m counting down the days!! This weather makes it impossible to dress for – it’s spring, but it’s winter weather. I suppose that’s what I get for putting away my winter coats. Anyone else? 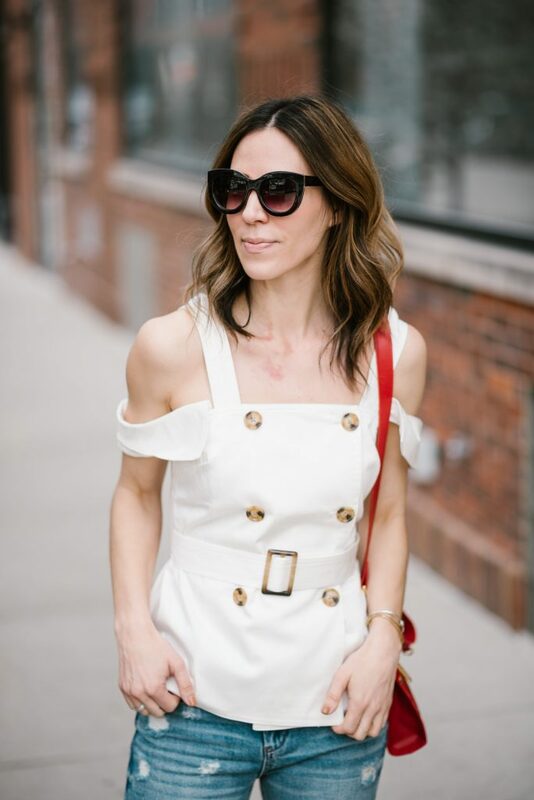 Today I’m trying to grasp spring from afar with this gorgeous white top from Shopbop – it’s the perfect piece for work and play! 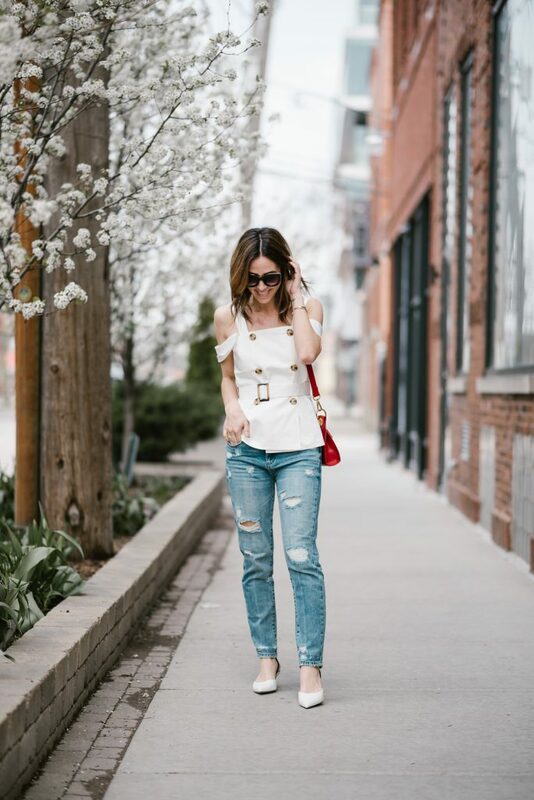 This Spring Fling with CMeo Collective white off the shoulder is getting me in the mood for warmer weather…I just hope Chicago gets the hint! 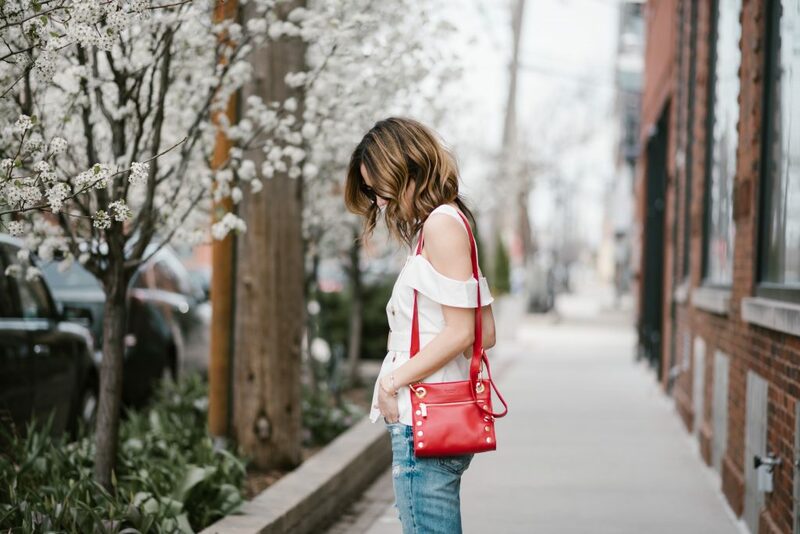 There are so many amazing things to say about this CMeo Collective top – I’ve been on a SERIOUS hunt for new clothes that I can wear for everyday and work and my collection is starting this with this top! I’ve always been temped to wear an off-the-shoulder top to work and now I can – the double straps make it easy to get away with 🙂 The buttons on the front and belt add an casual element to the top, but can be easily paired with blank slacks (so 90’s of me or a pencil skirt). Products from this look and why I love them! Framework Top – LOVE this top! I snagged it during the Shopbop Sale and it’s amazing! Great for work and play! Blank NYC Distressed Denim – Added these to my Blank NYC collection – they are a great weekend or casual jean. Hammitt Crossbody – Hammitt makes fabulous bags that are made in the USA! Love the pop of color this adds to my look! White Mules – I normally really dislike white, but these shoes are really great for spring / summer work! Cat Eye Sunglasses – Great pair of cat eye sunnies that won’t break the bank! Remember we I told you about how I LOVE Blank NYC Denim? Well today is no different. I love a good distressed denim – especially when they are under $100. Check them out here and on sale! Blank NYC Denim is a trusted denim brand and everything is priced under $100! My wardrobe has been fairly neutral lately so pops of color here and there with my accessories os a must! 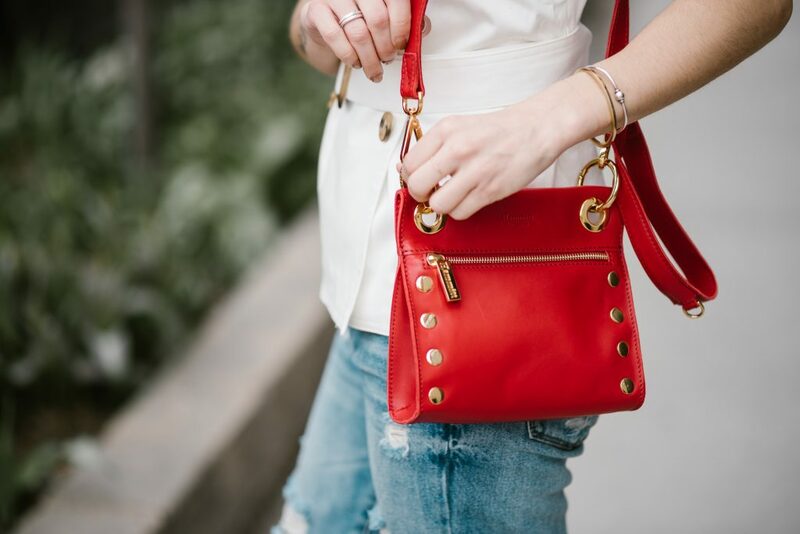 This Hammitt red crossbody is the perfect pop of color to this look! The best part? They are made right here in the USA! Be sure to check out my wedding series I started a few weeks ago and I go through the planning process as a bride as well! This whole process has been such a great ride that I feel obligated to share my story with you all in hopes that it can help you plan your special day. We finally got our invites out the door so I’m finally starting to feel like a sane person again! It’s like there are 12 elephants on my back throughout this process and I’m finally starting to toss some of them off! Ha! Check out the series here. I just want to mention I’m all new to blogging and really loved this web-site. More than likely I’m going to bookmark your website . You actually come with very good articles. Thanks for sharing your blog. Hiya, I’m really glad I’ve found this info. Today bloggers publish just about gossip and web stuff and this is really frustrating. A good website with interesting content, that is what I need. Thank you for making this web site, and I will be visiting again. Do you do newsletters by email? Hey there. I found your blog via Google whilst searching for a similar matter, your site got here up. It seems to be good. I have bookmarked it in my google bookmarks to visit then. Hi there. I found your site via Google while looking for a related topic, your site came up. It looks good. I have bookmarked it in my google bookmarks to visit then. Hiya, I’m really glad I’ve found this info. Nowadays bloggers publish only about gossip and web stuff and this is really irritating. A good website with interesting content, that is what I need. Thanks for making this web-site, and I will be visiting again. Do you do newsletters by email? Hiya, I’m really glad I have found this information. Nowadays bloggers publish just about gossip and web stuff and this is actually irritating. A good web site with interesting content, that’s what I need. Thank you for making this web site, and I will be visiting again. Do you do newsletters by email? Hi there. I found your web site by means of Google whilst looking for a related topic, your website came up. It seems to be great. I have bookmarked it in my google bookmarks to come back then. Hiya, I am really glad I’ve found this info. Today bloggers publish just about gossip and internet stuff and this is really irritating. A good site with interesting content, that’s what I need. Thanks for making this web-site, and I will be visiting again. Do you do newsletters by email? Hi there. I discovered your blog by means of Google whilst searching for a related topic, your web site got here up. It appears to be great. I have bookmarked it in my google bookmarks to come back then. Hiya, I’m really glad I’ve found this information. Nowadays bloggers publish only about gossip and net stuff and this is really irritating. A good blog with interesting content, that is what I need. Thanks for making this website, and I’ll be visiting again. Do you do newsletters by email? Hiya, I’m really glad I have found this info. Today bloggers publish only about gossip and web stuff and this is really irritating. A good site with exciting content, this is what I need. Thanks for making this site, and I’ll be visiting again. Do you do newsletters by email? Hiya, I am really glad I have found this information. Nowadays bloggers publish only about gossip and net stuff and this is really annoying. A good site with exciting content, this is what I need. Thank you for making this website, and I will be visiting again. Do you do newsletters by email? Hi there. I discovered your website via Google even as searching for a similar subject, your site came up. It appears to be good. I have bookmarked it in my google bookmarks to come back then. Hello there. I found your blog by way of Google at the same time as looking for a comparable matter, your site came up. It seems good. I’ve bookmarked it in my google bookmarks to come back then. Hey there. I discovered your blog by way of Google whilst looking for a comparable subject, your website got here up. It seems to be great. I’ve bookmarked it in my google bookmarks to come back then. Hi there. I found your website by way of Google whilst searching for a comparable subject, your site got here up. It looks great. I’ve bookmarked it in my google bookmarks to visit then. Hey there. I discovered your website by means of Google whilst looking for a related topic, your website got here up. It appears to be great. I’ve bookmarked it in my google bookmarks to visit then. Hiya, I am really glad I have found this information. Nowadays bloggers publish just about gossip and internet stuff and this is actually irritating. A good web site with exciting content, this is what I need. Thanks for making this web site, and I’ll be visiting again. Do you do newsletters by email? Hey there. I found your blog by way of Google whilst searching for a related subject, your web site came up. It seems great. I’ve bookmarked it in my google bookmarks to come back then. Hiya, I am really glad I’ve found this info. Nowadays bloggers publish just about gossip and net stuff and this is actually frustrating. A good web site with exciting content, this is what I need. Thanks for making this web-site, and I will be visiting again. Do you do newsletters by email? Hiya, I am really glad I’ve found this info. Nowadays bloggers publish just about gossip and net stuff and this is really annoying. A good blog with interesting content, that is what I need. Thank you for making this site, and I’ll be visiting again. Do you do newsletters by email? Hi there. I discovered your web site by way of Google at the same time as looking for a similar subject, your site came up. It appears great. I’ve bookmarked it in my google bookmarks to come back then. Hi there. I found your blog via Google even as looking for a similar matter, your web site came up. It seems to be great. I have bookmarked it in my google bookmarks to visit then. Hey there. I discovered your web site by the use of Google while searching for a similar matter, your web site came up. It appears good. I’ve bookmarked it in my google bookmarks to come back then. Hiya, I’m really glad I’ve found this information. Nowadays bloggers publish just about gossip and net stuff and this is actually annoying. A good site with exciting content, this is what I need. Thanks for making this web site, and I’ll be visiting again. Do you do newsletters by email? Hey there. I discovered your web site via Google while looking for a related subject, your web site came up. It appears to be great. I have bookmarked it in my google bookmarks to come back then. Hi there. I discovered your site by the use of Google even as looking for a similar matter, your website got here up. It seems great. I have bookmarked it in my google bookmarks to come back then. Hey there. I found your web site by the use of Google even as looking for a comparable subject, your website got here up. It appears great. I’ve bookmarked it in my google bookmarks to come back then. Hiya, I am really glad I’ve found this information. Today bloggers publish just about gossip and net stuff and this is really irritating. A good web site with interesting content, that is what I need. Thank you for making this website, and I will be visiting again. Do you do newsletters by email? Hello there. I found your site by the use of Google while looking for a comparable topic, your site got here up. It looks great. I’ve bookmarked it in my google bookmarks to visit then. Hiya, I’m really glad I’ve found this information. Today bloggers publish just about gossip and net stuff and this is really frustrating. A good website with exciting content, that is what I need. Thanks for making this site, and I will be visiting again. Do you do newsletters by email? Hey there. I found your website via Google even as searching for a similar topic, your website got here up. It seems good. I have bookmarked it in my google bookmarks to come back then. Hi there. I discovered your blog via Google while looking for a comparable topic, your site came up. It appears great. I’ve bookmarked it in my google bookmarks to come back then. Hi there. I found your website by means of Google even as looking for a comparable matter, your website came up. It looks good. I’ve bookmarked it in my google bookmarks to visit then. Hello there. I discovered your site via Google even as searching for a related matter, your website got here up. It seems to be great. I have bookmarked it in my google bookmarks to visit then. Hello there. I discovered your web site by way of Google at the same time as searching for a related subject, your web site came up. It appears to be great. I have bookmarked it in my google bookmarks to come back then. Hiya, I’m really glad I’ve found this info. Today bloggers publish just about gossip and web stuff and this is really frustrating. A good web site with interesting content, that’s what I need. Thank you for making this website, and I will be visiting again. Do you do newsletters by email? Hi there. I discovered your web site by means of Google even as looking for a comparable subject, your website came up. It seems good. I’ve bookmarked it in my google bookmarks to come back then. Hiya, I am really glad I’ve found this info. Today bloggers publish just about gossip and net stuff and this is really frustrating. A good blog with interesting content, that is what I need. Thanks for making this web-site, and I’ll be visiting again. Do you do newsletters by email? Hey there. I discovered your site via Google even as looking for a comparable matter, your site came up. It seems good. I have bookmarked it in my google bookmarks to come back then. Hiya, I’m really glad I’ve found this info. Today bloggers publish just about gossip and internet stuff and this is actually irritating. A good web site with exciting content, this is what I need. Thanks for making this site, and I’ll be visiting again. Do you do newsletters by email? Hey there. I discovered your site by means of Google even as looking for a related topic, your website got here up. It looks good. I have bookmarked it in my google bookmarks to come back then. Hello there. I discovered your site by means of Google whilst searching for a similar topic, your website came up. It seems good. I have bookmarked it in my google bookmarks to come back then. Hey there. I found your blog by way of Google whilst looking for a comparable topic, your website got here up. It seems good. I have bookmarked it in my google bookmarks to visit then. Hello there. I found your website by means of Google even as searching for a related topic, your website came up. It appears great. I have bookmarked it in my google bookmarks to visit then. Hey there. I found your site by means of Google even as looking for a comparable matter, your website got here up. It appears to be good. I have bookmarked it in my google bookmarks to visit then. Hello there. I discovered your blog by means of Google at the same time as searching for a similar topic, your site got here up. It looks good. I have bookmarked it in my google bookmarks to visit then. Hello there. I found your blog via Google while searching for a related topic, your web site came up. It appears good. I’ve bookmarked it in my google bookmarks to visit then. Hi there. I found your web site by means of Google even as searching for a similar matter, your web site came up. It seems to be good. I’ve bookmarked it in my google bookmarks to visit then. Hiya, I am really glad I’ve found this info. Nowadays bloggers publish just about gossip and web stuff and this is actually irritating. A good website with interesting content, that is what I need. Thank you for making this site, and I’ll be visiting again. Do you do newsletters by email? Hello there. I found your site by way of Google at the same time as searching for a related topic, your website came up. It appears to be good. I’ve bookmarked it in my google bookmarks to come back then. Hiya, I am really glad I have found this info. Today bloggers publish just about gossip and web stuff and this is really irritating. A good website with interesting content, that’s what I need. Thanks for making this web site, and I will be visiting again. Do you do newsletters by email? Hello there. I found your web site via Google even as looking for a related subject, your website came up. It appears good. I have bookmarked it in my google bookmarks to come back then. Hi there. I discovered your website by way of Google while searching for a similar matter, your website got here up. It looks good. I have bookmarked it in my google bookmarks to visit then. Hey there. I discovered your site by way of Google whilst searching for a related matter, your site got here up. It looks good. I have bookmarked it in my google bookmarks to visit then. Hi there. I found your site by way of Google at the same time as looking for a comparable topic, your web site got here up. It looks good. I have bookmarked it in my google bookmarks to visit then. Hiya, I am really glad I have found this information. Nowadays bloggers publish just about gossip and web stuff and this is really annoying. A good website with interesting content, this is what I need. Thanks for making this website, and I will be visiting again. Do you do newsletters by email? Hi there. I discovered your web site via Google at the same time as searching for a related topic, your website came up. It looks good. I have bookmarked it in my google bookmarks to visit then. Hi there. I found your website by means of Google whilst searching for a comparable topic, your website came up. It appears to be great. I’ve bookmarked it in my google bookmarks to visit then. Hiya, I am really glad I’ve found this information. Nowadays bloggers publish only about gossip and net stuff and this is actually annoying. A good site with interesting content, that is what I need. Thank you for making this site, and I’ll be visiting again. Do you do newsletters by email? Hey there. I found your website by way of Google even as looking for a related topic, your web site got here up. It seems good. I have bookmarked it in my google bookmarks to visit then. Hi there. I discovered your blog via Google at the same time as searching for a related subject, your website came up. It appears to be good. I have bookmarked it in my google bookmarks to visit then. Hiya, I’m really glad I’ve found this info. Today bloggers publish only about gossip and net stuff and this is actually annoying. A good site with exciting content, this is what I need. Thanks for making this web-site, and I’ll be visiting again. Do you do newsletters by email? Hiya, I am really glad I’ve found this information. Nowadays bloggers publish only about gossip and web stuff and this is really irritating. A good website with exciting content, that’s what I need. Thanks for making this website, and I will be visiting again. Do you do newsletters by email? Hi there. I found your site by way of Google while looking for a related subject, your web site came up. It appears great. I have bookmarked it in my google bookmarks to visit then. Hiya, I’m really glad I’ve found this information. Nowadays bloggers publish only about gossip and web stuff and this is actually frustrating. A good blog with interesting content, that’s what I need. Thank you for making this website, and I’ll be visiting again. Do you do newsletters by email? Hi there. I found your web site by means of Google at the same time as searching for a comparable matter, your site got here up. It seems to be great. I have bookmarked it in my google bookmarks to come back then. Hey there. I discovered your web site by way of Google while looking for a related subject, your site came up. It seems good. I have bookmarked it in my google bookmarks to visit then. Hiya, I am really glad I’ve found this info. Nowadays bloggers publish just about gossip and web stuff and this is really irritating. A good website with exciting content, that’s what I need. Thanks for making this web site, and I’ll be visiting again. Do you do newsletters by email? Hey there. I discovered your website via Google even as searching for a similar subject, your website got here up. It seems to be good. I have bookmarked it in my google bookmarks to visit then. Hello there. I discovered your website by way of Google at the same time as looking for a similar subject, your web site got here up. It looks great. I have bookmarked it in my google bookmarks to come back then. Hiya, I’m really glad I have found this information. Nowadays bloggers publish just about gossip and internet stuff and this is really annoying. A good web site with interesting content, that is what I need. Thanks for making this site, and I’ll be visiting again. Do you do newsletters by email? Hiya, I am really glad I’ve found this info. Today bloggers publish just about gossip and internet stuff and this is actually frustrating. A good web site with exciting content, this is what I need. Thank you for making this site, and I’ll be visiting again. Do you do newsletters by email? Hiya, I am really glad I have found this info. Today bloggers publish just about gossip and net stuff and this is really irritating. A good blog with interesting content, that is what I need. Thank you for making this website, and I will be visiting again. Do you do newsletters by email? Hi there. I found your website via Google while searching for a comparable matter, your website came up. It seems good. I’ve bookmarked it in my google bookmarks to visit then. Hiya, I’m really glad I’ve found this info. Today bloggers publish only about gossip and net stuff and this is actually frustrating. A good website with interesting content, that’s what I need. Thanks for making this site, and I will be visiting again. Do you do newsletters by email? Hiya, I’m really glad I’ve found this info. Today bloggers publish just about gossip and web stuff and this is actually annoying. A good blog with interesting content, that is what I need. Thanks for making this website, and I’ll be visiting again. Do you do newsletters by email? Hey there. I found your blog by means of Google even as looking for a related topic, your web site got here up. It seems to be great. I’ve bookmarked it in my google bookmarks to visit then. Hiya, I am really glad I have found this info. Today bloggers publish only about gossip and net stuff and this is actually frustrating. A good web site with exciting content, that’s what I need. Thanks for making this web-site, and I’ll be visiting again. Do you do newsletters by email? Hiya, I am really glad I’ve found this information. Today bloggers publish only about gossip and net stuff and this is really annoying. A good website with exciting content, that is what I need. Thank you for making this site, and I’ll be visiting again. Do you do newsletters by email? Hello there. I discovered your blog via Google while searching for a similar topic, your website got here up. It appears to be great. I have bookmarked it in my google bookmarks to visit then. Hiya, I’m really glad I have found this info. Nowadays bloggers publish only about gossip and net stuff and this is actually irritating. A good site with interesting content, that is what I need. Thanks for making this web site, and I’ll be visiting again. Do you do newsletters by email? Hey there. I discovered your blog by the use of Google even as searching for a related matter, your web site came up. It appears good. I have bookmarked it in my google bookmarks to come back then. Hi there. I found your blog via Google whilst searching for a related matter, your site came up. It seems good. I have bookmarked it in my google bookmarks to come back then. Hey there. I found your site via Google while searching for a related topic, your website got here up. It looks great. I have bookmarked it in my google bookmarks to visit then. Hiya, I am really glad I’ve found this info. Today bloggers publish only about gossip and net stuff and this is really irritating. A good web site with interesting content, that’s what I need. Thank you for making this site, and I will be visiting again. Do you do newsletters by email? Hey there. I discovered your website by the use of Google even as searching for a similar matter, your website came up. It seems to be good. I have bookmarked it in my google bookmarks to visit then. Hiya, I am really glad I’ve found this information. Today bloggers publish only about gossip and internet stuff and this is actually irritating. A good website with interesting content, this is what I need. Thanks for making this web site, and I will be visiting again. Do you do newsletters by email? Hi there. I discovered your web site via Google at the same time as searching for a similar subject, your site came up. It appears to be great. I have bookmarked it in my google bookmarks to come back then. Hi there. I found your site by means of Google even as searching for a similar topic, your website came up. It appears great. I have bookmarked it in my google bookmarks to come back then. Hiya, I am really glad I’ve found this information. Today bloggers publish just about gossip and internet stuff and this is really annoying. A good website with exciting content, that is what I need. Thanks for making this website, and I’ll be visiting again. Do you do newsletters by email? Hey there. I found your web site via Google whilst looking for a related matter, your website came up. It appears great. I have bookmarked it in my google bookmarks to come back then. Hey there. I discovered your blog by the use of Google while looking for a related matter, your web site came up. It looks good. I’ve bookmarked it in my google bookmarks to visit then. Hiya, I am really glad I have found this information. Today bloggers publish only about gossip and internet stuff and this is actually annoying. A good site with exciting content, that is what I need. Thanks for making this web site, and I will be visiting again. Do you do newsletters by email? Hey there. I discovered your blog by means of Google even as looking for a related matter, your web site got here up. It appears to be great. I have bookmarked it in my google bookmarks to visit then. Hiya, I’m really glad I have found this information. Nowadays bloggers publish just about gossip and web stuff and this is actually annoying. A good blog with exciting content, that is what I need. Thank you for making this website, and I will be visiting again. Do you do newsletters by email? Hey there. I found your web site by way of Google while searching for a similar topic, your website came up. It appears good. I have bookmarked it in my google bookmarks to come back then. Hiya, I’m really glad I have found this info. Today bloggers publish only about gossip and net stuff and this is actually frustrating. A good blog with exciting content, that’s what I need. Thank you for making this web-site, and I’ll be visiting again. Do you do newsletters by email? Hello there. I found your website by way of Google while looking for a similar matter, your site got here up. It looks great. I have bookmarked it in my google bookmarks to come back then. Hi there. I discovered your site by the use of Google whilst searching for a related matter, your web site came up. It seems to be good. I’ve bookmarked it in my google bookmarks to visit then. Hi there. I found your website by way of Google whilst looking for a related matter, your site got here up. It seems good. I have bookmarked it in my google bookmarks to visit then. Hey there. I discovered your web site by way of Google whilst searching for a similar subject, your website got here up. It looks good. I’ve bookmarked it in my google bookmarks to visit then. Hiya, I am really glad I have found this info. Nowadays bloggers publish just about gossip and web stuff and this is really annoying. A good web site with interesting content, this is what I need. Thank you for making this web-site, and I will be visiting again. Do you do newsletters by email? Hello there. I discovered your site by the use of Google at the same time as searching for a related matter, your website got here up. It seems great. I’ve bookmarked it in my google bookmarks to visit then. Hiya, I am really glad I’ve found this information. Today bloggers publish only about gossip and net stuff and this is actually annoying. A good website with exciting content, that’s what I need. Thanks for making this site, and I’ll be visiting again. Do you do newsletters by email? Hi there. I discovered your site by way of Google at the same time as searching for a comparable subject, your web site came up. It looks great. I have bookmarked it in my google bookmarks to come back then. Hello there. I found your website via Google at the same time as searching for a similar subject, your site got here up. It seems to be great. I have bookmarked it in my google bookmarks to visit then. Hey there. I found your website via Google while searching for a related topic, your web site got here up. It seems great. I have bookmarked it in my google bookmarks to come back then. Hiya, I am really glad I have found this info. Today bloggers publish just about gossip and internet stuff and this is actually irritating. A good blog with exciting content, that’s what I need. Thanks for making this web-site, and I’ll be visiting again. Do you do newsletters by email? Hiya, I’m really glad I have found this information. Nowadays bloggers publish only about gossip and net stuff and this is actually frustrating. A good website with interesting content, that’s what I need. Thanks for making this website, and I’ll be visiting again. Do you do newsletters by email? Hey there. I found your blog by way of Google at the same time as searching for a comparable topic, your web site came up. It looks great. I’ve bookmarked it in my google bookmarks to visit then. Hey there. I found your web site by way of Google even as searching for a related topic, your web site came up. It looks great. I have bookmarked it in my google bookmarks to visit then. Hiya, I’m really glad I have found this information. Today bloggers publish just about gossip and web stuff and this is really frustrating. A good web site with exciting content, that is what I need. Thanks for making this web-site, and I’ll be visiting again. Do you do newsletters by email? Hiya, I am really glad I have found this information. Today bloggers publish only about gossip and internet stuff and this is actually frustrating. A good site with exciting content, that is what I need. Thank you for making this site, and I’ll be visiting again. Do you do newsletters by email? Hiya, I am really glad I have found this information. Today bloggers publish only about gossip and net stuff and this is actually irritating. A good website with interesting content, this is what I need. Thank you for making this web site, and I will be visiting again. Do you do newsletters by email? Hiya, I’m really glad I have found this info. Nowadays bloggers publish only about gossip and internet stuff and this is really annoying. A good site with exciting content, that is what I need. Thank you for making this site, and I will be visiting again. Do you do newsletters by email? Hi there. I found your blog by way of Google whilst looking for a comparable subject, your web site came up. It appears to be great. I’ve bookmarked it in my google bookmarks to come back then. Hiya, I’m really glad I have found this information. Today bloggers publish only about gossip and internet stuff and this is actually annoying. A good blog with interesting content, that’s what I need. Thanks for making this website, and I’ll be visiting again. Do you do newsletters by email? Hiya, I am really glad I have found this info. Today bloggers publish only about gossip and web stuff and this is really frustrating. A good web site with interesting content, that is what I need. Thank you for making this web site, and I will be visiting again. Do you do newsletters by email? Hey there. I discovered your website by the use of Google while looking for a comparable subject, your website got here up. It appears to be good. I have bookmarked it in my google bookmarks to come back then. Hello there. I found your website by means of Google whilst searching for a similar topic, your site came up. It looks great. I’ve bookmarked it in my google bookmarks to visit then. Hiya, I’m really glad I have found this information. Nowadays bloggers publish only about gossip and net stuff and this is actually annoying. A good web site with exciting content, this is what I need. Thanks for making this web site, and I’ll be visiting again. Do you do newsletters by email? Hiya, I am really glad I’ve found this information. Nowadays bloggers publish only about gossip and web stuff and this is actually frustrating. A good blog with interesting content, that’s what I need. Thank you for making this web-site, and I will be visiting again. Do you do newsletters by email? Hiya, I am really glad I’ve found this information. Nowadays bloggers publish just about gossip and web stuff and this is actually irritating. A good web site with interesting content, this is what I need. Thank you for making this site, and I’ll be visiting again. Do you do newsletters by email? Hiya, I am really glad I have found this information. Today bloggers publish only about gossip and net stuff and this is actually irritating. A good site with exciting content, that’s what I need. Thank you for making this web-site, and I’ll be visiting again. Do you do newsletters by email? Hey there. I discovered your website by the use of Google even as looking for a comparable subject, your website came up. It looks great. I’ve bookmarked it in my google bookmarks to visit then. Hello there. I discovered your site by way of Google at the same time as searching for a related topic, your website came up. It seems great. I’ve bookmarked it in my google bookmarks to visit then. Hey there. I found your web site by way of Google even as looking for a comparable topic, your web site came up. It looks great. I have bookmarked it in my google bookmarks to visit then. Hello there. I found your web site by way of Google at the same time as looking for a related topic, your website got here up. It seems to be good. I’ve bookmarked it in my google bookmarks to come back then. Hi there. I discovered your website by the use of Google while looking for a similar matter, your site came up. It looks good. I have bookmarked it in my google bookmarks to visit then. Hey there. I found your web site by the use of Google while looking for a similar matter, your website came up. It looks great. I’ve bookmarked it in my google bookmarks to visit then. Hi there. I found your blog by means of Google at the same time as searching for a related topic, your site came up. It seems to be great. I have bookmarked it in my google bookmarks to come back then. Hiya, I’m really glad I have found this info. Nowadays bloggers publish only about gossip and net stuff and this is actually annoying. A good website with interesting content, that’s what I need. Thanks for making this web-site, and I will be visiting again. Do you do newsletters by email? Hello there. I discovered your website via Google whilst searching for a similar matter, your web site got here up. It looks good. I have bookmarked it in my google bookmarks to visit then. Hiya, I am really glad I’ve found this information. Today bloggers publish only about gossip and internet stuff and this is really irritating. A good blog with interesting content, that’s what I need. Thanks for making this web-site, and I’ll be visiting again. Do you do newsletters by email? Hey there. I discovered your web site by way of Google while searching for a similar subject, your website got here up. It seems to be great. I’ve bookmarked it in my google bookmarks to visit then. Hi there. I discovered your web site by way of Google even as searching for a related subject, your web site got here up. It seems to be great. I’ve bookmarked it in my google bookmarks to come back then. Hi there. I discovered your website by means of Google whilst looking for a related topic, your web site got here up. It seems to be good. I’ve bookmarked it in my google bookmarks to visit then. Hiya, I am really glad I have found this information. Nowadays bloggers publish only about gossip and web stuff and this is actually frustrating. A good site with interesting content, this is what I need. Thank you for making this site, and I’ll be visiting again. Do you do newsletters by email? Hiya, I’m really glad I’ve found this info. Nowadays bloggers publish just about gossip and net stuff and this is actually frustrating. A good blog with interesting content, that is what I need. Thank you for making this site, and I will be visiting again. Do you do newsletters by email? Hiya, I am really glad I’ve found this info. Today bloggers publish only about gossip and web stuff and this is really frustrating. A good website with interesting content, that’s what I need. Thanks for making this website, and I will be visiting again. Do you do newsletters by email?